Square-Enix has just announced two of its E3 games: a dramatic new twist on mech franchise Front Mission and Nier, a mysterious action-adventure game. Square-Enix is on a mission to be more than just a company that produces games full of spiky hair and giant swords, as evidenced by the two games the publisher just announced for its E3 lineup. Both another game developed by a Western company to a brand-new IP, they show that Square-Enix is trying pretty hard to diversify its portfolio. 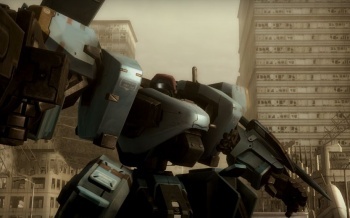 Front Mission Evolved is the latest in the company's long-running mech-centric military franchise. It sounds like it eschews the meticulous strategy and customization of the series for more straightforward third-person shooter gameplay. Developed by Double Helix Games of Silent Hill: Homecoming fame, Evolved features a single-player campaign and online multiplayer. It will probably alienate die-hard fans upset they don't have to keep track of ten different kinds of stats for each individual component of their robot's arms any more. Nier is another action title, developed by Cavia, whose resume includes a number of anime games and the somewhat forgettable Bullet Witch, and puts players in the role of an "unyielding protagonist" named Nier, who is attempting to find a cure for a disease that has infected his daughter. He fights with "powerful allies and a mysterious book." Fighting with books? See - knowledge is power! So there you have it - two more representatives of the new (and obviously Western-friendly) Square-Enix. Will it be enough to give the company a new global face?